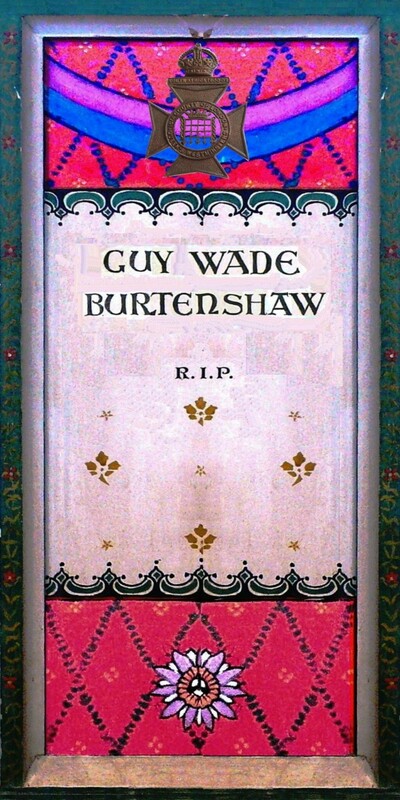 Guy Wade Burtenshaw was born and baptised in the parish of St.Barnabas Rotherhithe at 37 Plough Road. He was the second child of that name born to Arthur and Alice Burtenshaw, his previous namesake dying in 1884 aged 0. By 1891 the family was complete, with younger sister May, born 22/8/1886 and brother, Arthur born 23/5/1888. Their father, Arthur is described as a Milk Contractor. Thereafter according to the 1891 Census he he seems to have had a spell as a Laundry man in Bromley. By 1901 the family is located in Christchurch, Monmouth and he is described there as Farmer Dairy Co. Manager and listed as an Employer. Only Guy is listed with the family and the whereabouts of May and Arthur is not known. 1911 finds the family in Ashford in Kent, with still no sign of young Arthur, but May is back home with Guy who is now working as an estate agent’s clerk. Their father, still a Dairyman but now widowed and re-married to Edith Elsie Brand. The ceremony took place at Christchurch Marylebone on December 27th 1910. She was his junior by 26 years. Guy was a witness to their marriage in London and was then very nearly the same age as his stepmother. The other witness to the marriage was Albert George Wise who was married to Edith’s older sister Nellie. The girls’ parents were both Norfolk people though by then living in London. Their father Robert Brand was from Witchingham and their mother Eliza from Brisley. Guy possibly never even came to Ryburgh as it is not known precisely when his father and stepmother moved to the village. The family are recorded on Guy’s Medal Index card as being of the Thatched House in Little Ryburgh. 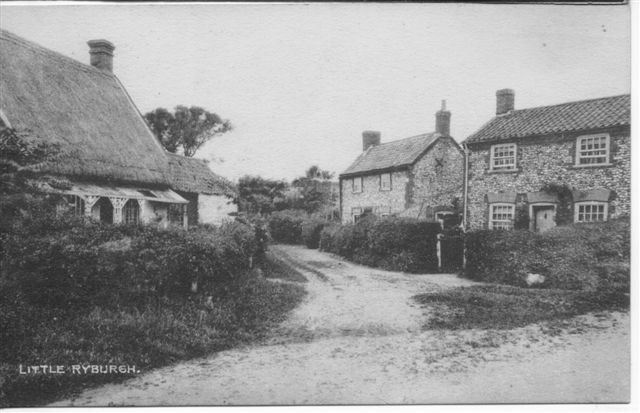 This is undoubtedly the house in the middle of the village depicted on the only surviving postcard image of Little Ryburgh seen to date. Thereafter, they lived at 101 Fakenham Road. The Little Ryburgh house was demolished c 1980 and by then it had lost its thatch and had a pantiled roof. Of Guy, we otherwise know very little, except that he died of his wounds on June 18th 1915 at No. 3 Casualty Clearing Station. No. 3 C.C.S. was situated in what was described as the lunatic asylum at Bailleul close to the Belgian border. He had only been in France since November 1st. 1914, the same day that Ryburgh’s first casualty, John Cremer was killed. 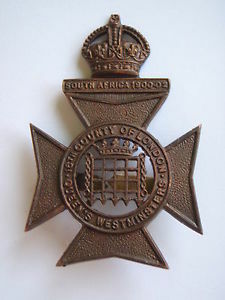 He was awarded the usual trio of medals which were applied for by his father when living in Little Ryburgh. If anyone has more information about Guy or his extended Ryburgh family, we would of course be very pleased to hear from you via the Contact us page on this site.